A fixed filter bank provides direct access to the spectrum components of a given signal, breaking it into narrow bands you can fiddle with individually. Just lending an LFO to contort the low end of a guitar phrase, or letting a square wave impose a rhythm by turning on and off some mid-range — it’s an approach I have come to love. In this patch, a fairly rich noise source is being sent through a fixed filter bank. Four spans of the filter bank are going into a voltage-controlled mixer, and those each are being modulated by a synchronized quad LFO. In addition, the bounds of the noise source are being affected slightly by a slow LFO, separate from the quad LFO. The filter bank is the newest module for me: the FXDf from Make Noise. The noise source is the Fourses module from Peter Blasser’s Ieaskul F. Mobenthey. The mixer is the ADDAC 802. The quad LFO is the Batumi from Xaoc. The additional LFO is the Dixie II from Intellijel. The audio was recorded on a Zoom H4n via a Mackie mixer. The track was then trimmed of some high end and given a fade-in and a fade-out in Adobe Audition. The Assignment: Create a sonic diary of the past year with a dozen (or more) super-brief segments. Deadline: This project’s deadline is Monday, December 31, 2018, at 11:59pm (that is, just before midnight) wherever you are on. It was posted in the morning, California time, on Thursday, December 27, 2018. The Assignment: The Assignment: Create a sonic diary of the past year with a dozen (or more) super-brief segments. As is the tradition at the end of each calendar year, this week’s project is a sound journal, a selective audio history of your past twelve months. 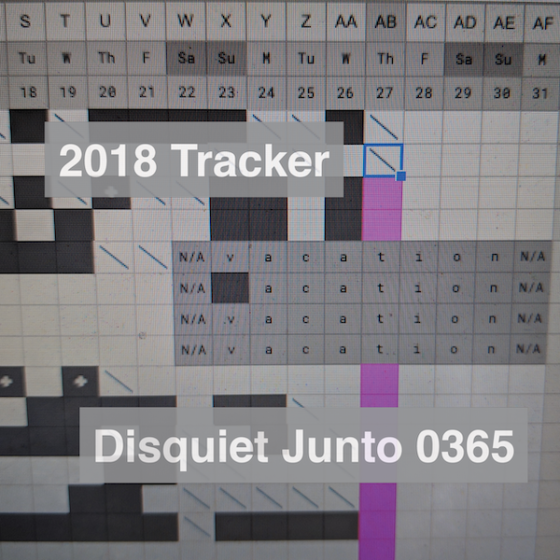 Step 1: You will select a different audio element to represent each of the past 12 months of 2018 — or you might choose even more elements, perhaps building on the idea that this is the 365th weekly Junto project, and there are 365 days in the year. These audio elements will most likely be of music that you have yourself composed and recorded, but they might also consist of phone messages, field recordings, or other source material. These items should be somehow personal in nature, suitable to the autobiographical intention of the project; they should be of your own making, and not drawn from third-party sources. Step 2: You will then select one segment from each of these dozen audio elements (if you’re doing a dozen items, one for each month, then five-second segments are recommended). Step 3: Then you will stitch these segments together in chronological order to form one single track. There should be no overlap or gap between segments; they should simply proceed from one to the next. 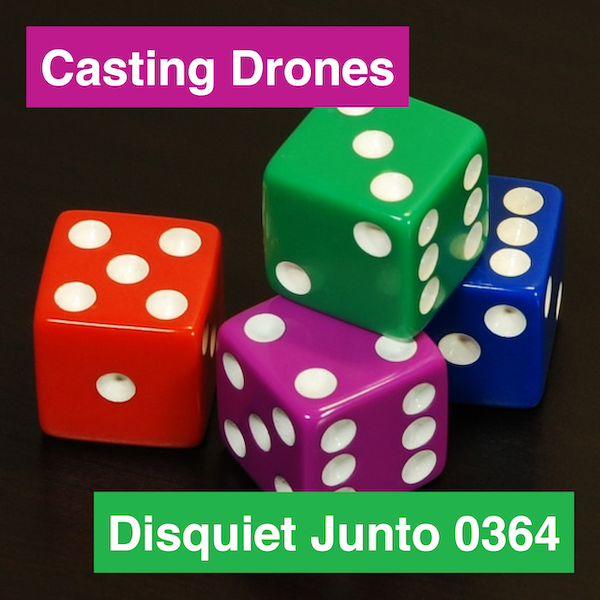 Step 1: Include “disquiet0365” (no spaces or quotation marks) in the name of your track. Step 2: If your audio-hosting platform allows for tags, be sure to also include the project tag “disquiet0365” (no spaces or quotation marks). If you’re posting on SoundCloud in particular, this is essential to subsequent location of tracks for the creation a project playlist. Title/Tag: When posting your track, please include “disquiet0365” in the title of the track, and where applicable (on SoundCloud, for example) as a tag. The Assignment: Use dice to determine your slowly shifting tones. Deadline: This project’s deadline is Monday, December 24, 2018, at 11:59pm (that is, just before midnight) wherever you are on. It was posted in the afternoon, California time, on Thursday, December 20, 2018. Many thanks to Todd Elliott (aka Toaster) for having proposed this project. We’re going to use chance operations to make drone music (giving credit to John Cage, in particular for the compositional concept of time brackets). You’ll need some multitimbral sound sources that are capable of making sustained tones, or you can just write out the score and build up the drone via overdubbing. Step 1: Create a single sustained tone that can be held for as long as necessary. This will serve as a “base” for you to add onto in subsequent steps. Step 2: Roll two six-sided dice. The first die will be “time” and the second die will be the “notes.” Do this two additional times, so you have notated three pairs of time-plus-notes. The resulting time is the length of this segment, or bracket, of music. You’ll have three time brackets at the end of Step 3, resulting from the rolls in Step 2. Roll 1-4 = For the first bracket, this is the number of notes you can have playing at a single time. In the second and third brackets, this can also be interpreted as the number of notes you might, alternately, elect to change. Any introduction of notes or changing of notes should be done slowly and subtly — in other words, since this is drone music, the divide between brackets isn’t instantaneous. You should never have more than four notes playing at a time. If you already have four notes playing and you roll four, you can’t add more — so, instead change all four. If you have fewer notes playing than you roll, either add notes or change notes (player’s choice). For example, if you have three notes going, and you roll a two, either change the two notes or add one (to get to three). Step 5: The full length of your piece will be the combined length of those brackets plus one additional minute for a slow fade. During the last minute, you should remove all notes (at the pace and intervals you determine), and fade to silence. Throughout the piece, the foundational tone from Step 1 should be playing (until it also fades out in the final minute). Step 1: Include “disquiet0364” (no spaces or quotation marks) in the name of your track. Step 2: If your audio-hosting platform allows for tags, be sure to also include the project tag “disquiet0364” (no spaces or quotation marks). If you’re posting on SoundCloud in particular, this is essential to subsequent location of tracks for the creation a project playlist. Title/Tag: When posting your track, please include “disquiet0364” in the title of the track, and where applicable (on SoundCloud, for example) as a tag. Just this past Saturday night I participated in the annual caroling event known as Unsilent Night. Created by composer Phil Kline for a downtown Manhattan performance back in 1992, the work now occurs in numerous cities all around the globe. More than 40 Unsilent Nights are scheduled this year, according to the list at unsilentnight.com. Here in San Francisco, it’s been running annually since 2002 (one year prior to my moving back after four years in New Orleans). How Unsilent Night functions is as follows. Kline created four complementary ambient-chamber compositions, which collectively comprise the work. Everyone who showed up for Unsilent Night with a boombox used to be handed a cassette tape with a random one of the four parts. At the appointed moment, everyone would hit play, and the various tracks, all slightly out of sync, and resounding from devices of varying sound quality, would produce a kind of robot choir. Now, in the age of ubiquitous audio equipment, people can use cassettes, but more likely they’ve download one of the tracks to their phones. The underlying concept of Unsilent Night remains the same. If anything has changed in the decades since Unsilent Night began it is (1) the fidelity of the recordings has increased and (2) the procession begins and ends with the ceremonious sound of Bluetooth speakers engaging and disengaging. All of which came to mind when the excellent Burbank, California, music equipment shop Perfect Circuit posted a video yesterday of the seasonal audio installation currently running in its showroom. What it is is a bunch of boomboxes with droning, glistening loops of varying lengths. The video runs for 15 minutes, occasionally focusing in on a bit of motion, like a reel spinning slowly, or a counter ticking up one digit after another. If it weren’t for the company’s sonic logo at the video’s opening, it would be eminently loopable, an ambient Yule log. This is the latest video I’ve added to my YouTube playlist of recommended live performances of ambient music. Video originally published at YouTube. There are drones, and they are varied, and amid those drones are drones that are something else in disguise. Sometimes that something else is a trick of the ear, a figment surfacing in the sonic Rorschach test of extended abstraction. Sometimes it’s something buried just below the surface. If ambient music inherently explores the liminal, presenting a still surface that suggests untold action underneath, then a track like Szymon Kaliski’s superb “2018-12-13” plays with the ear by introducing elements hinting at a more formal music that never comes into focus. The piece opens with a dense drone, like the start of Simon and Garfunkel’s “El Condor Pasa” but pitched down an octave and left to loop seamlessly. The saddest sound, indeed, it progresses by not progressing, by instead gathering its hidden depths only so much that a glimpse of what might be a piano or an orchestra appears underneath. That such extremes might be confused for each other is a clue to the intensity of Kaliski’s stillness. Track originally posted at soundcloud.com/szymonkaliski. More from Kaliski, who is from Poznań, Poland, at szymonkaliski.com.